If you're having noise problems in your home or business, you can measure the decibel level with inexpensive apps on your iPhone or buy a decibel-reading device. I downloaded a free app from the App Store called "Decibels" and purchased an inexpensive one - with more features -- called "SPL Meter," but there's many to choose from (just search for "spl meter"). Basically these apps help you measure the decibel volume in your home when it's quiet, and again in different noise situations -- your neighbor's TV or stereo, the sound of cars and trucks outside your windows, the sound of barking dogs, crying babies, etc. All rooms have a decibel level, even when you think you're sitting in silence. So let's say the dB level in your home is 40 when it's quiet, but increases to 60 when your adjacent neighbors watch TV on their home theatre system. What does this mean when you look for soundproofing solutions? You need to research the STC (Sound Transmission Class) of the sound-control products -- the measurement at which they filter out noise in dB. Let's say that a typical American home is built on a wood frame with 5/8-inch gypsum walls and ceiling (approximately STC 40). Assume that the walls and ceiling are nailed directly onto hollow studs. At best, your home can only filter out 40 dB of sound. When it's quiet, no problem. But if your neighbors' TV comes through your walls and increases the noise level to 60 dB, you need a solution that delivers a minimal STC of 60, and preferably more. Of course, STC ratings alone don't cover all the acoustical quirks in your situation -- you might have flanking noise, resonance from something you can't control in the building, and other types of noise and considerations. 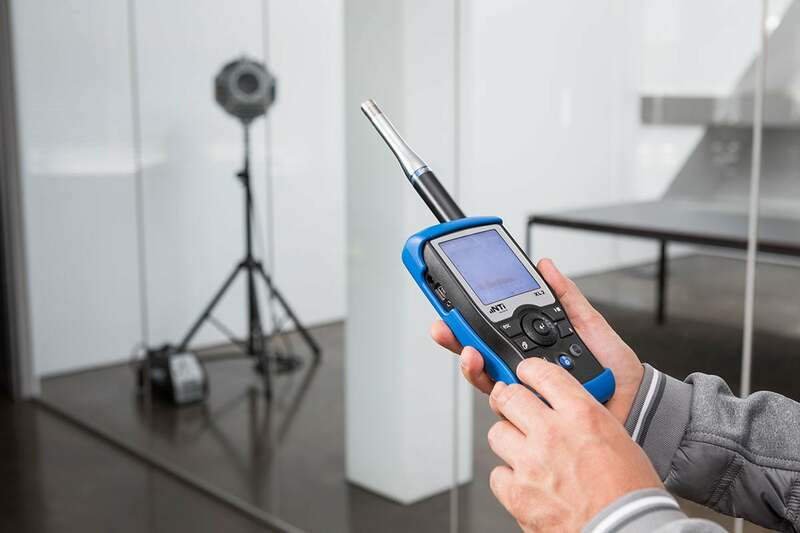 But if you can get a sense of the dB level of noise in your home under optimum conditions and again with common noise intrusion, you have some hard data when you search for a solution. Here's more information on dB and acoustical terminology and statistics. This glossary of acoustical terms offers lots of definitions, but not in layperson's language. This decibel chart lists the basic level of everyday noises, all the way up to noise that induces hearing loss. You can learn how some of these meters work through watching YouTube videos. For example, this hand-held SPL meter can be adjusted for frequency range and response rate. And this video shows how two Android decibel reading apps compare to a professional NTI noise analyzer. A professional noise analyzer offers weighted readings that are typically more precise than some of the smartphone apps. An NTI sound analyzer in a test environment. Hi - just found your blog. Very interesting. I own sound level meter and use it periodically to check out the level of noise around me. Your information on soundproofing looks good.